Pollution of the earth's largest bodies of waters, oceans, can take several forms. Once contaminated by these eight pollution sources, many delicate ecosystems need a long time to recover. Petroleum products used for fuel are mined from the earth deep below the ocean surfaces. Oil can end up pollute oceans in many ways. Oil seepage occurs on a smaller but continuous level, from oil leaks from cars and machines on the roads which are washed by rain into drains according to National Geographic. 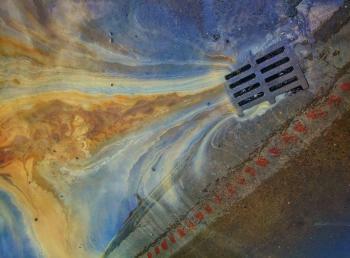 Occasionally, offshore drilling rigs experience accidental leaks, too. Americans discard 180 million gallons of used motor oil each year that pollutes water, notes the Execute Office of Energy and Environment Affairs of Massachusetts. The shipping industry causes 35% of oil pollution according to World Ocean Review. Leaching from factories, "municipal and industrial effluents," discharge from oil rigs, and burning of volatile oil are responsible for 45% of oil in waters notes World Ocean Review. This includes cooking oils and grease thrown down the sink drains in people's homes. Ships carrying oil have also been known to cause devastating oil spills, but these are large-scale disasters, and therefore account for only 10% of the oil pollution according to World Ocean Review. Like the rest of the pollution, most of the garbage that is found in the oceans comes from land, according to the California Coastal Commission. In fact, the National Oceanic and Atmospheric Administration (NOAA) says 80% of the pollution in oceans comes from land, and only 20% occurs in the oceans itself. Dumping is a large part of the problem. Plastics form 65 to 90% of this garbage according to Plastic Pollution. 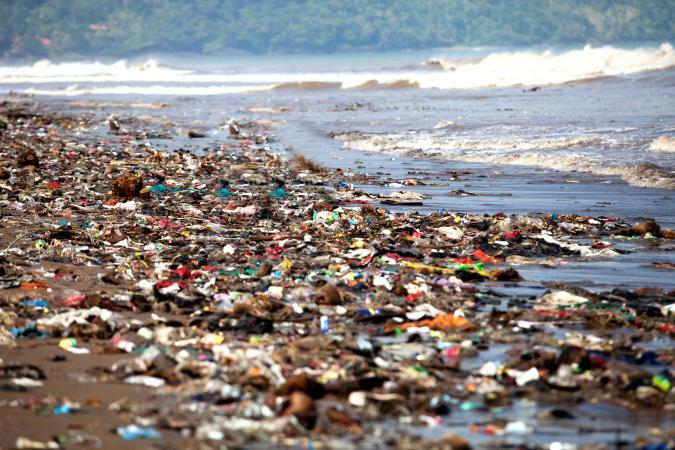 There was an estimated 165 million tons of plastic in the oceans by 2017 reports Business Insider International. This comes as no surprise to anyone who has seen plastic bags and bottles, and other waste floating onto the beaches. This is because in the last 50 year, plastic has grown to 20 times the rate back then. Aside from trash, industrial waste is one of the major issues when it comes to ocean dumping. Until the mid 1970s it was legal to dump industrial waste including nuclear material into oceans, and some illegal dumping still continues fears The MarineBio Conservation Society (MarineBio); in fact, 20-25% of dredging waste ends in oceans. This includes toxic chemicals which are a death sentence for ocean life forms. The garbage dumped directly in the oceans comes from offshore drilling rigs and various commercial, cargo, and pleasure ships, according to California Coastal Commission. As an Earth Island News report notes, the old rule "dilution is the solution to pollution" has caused much of the pollution not just of waterways, but also oceans. Encyclopedia.com explains this was the method used to dispose of waste when populations were small. It unfortunately continues even now, despite many acts and rules. Several forms of everyday waste produced on land end up in the ocean. Since most rivers empty into oceans, anything dumped into streams and rivers eventually reach oceans points out World Wide Fund for Nature (WWF) in the Marine Problems report. This leads to an increase in nutrients especially nitrogen and phosphorus that causes eutrophication and lack of oxygen. The result is dead zones in oceans as well as inland water bodies explains Scientific American. There are 400 dead zones in the world. This is also called nutrient pollution according to the U.S. Environmental Protection Agency (EPA) Effects report. It can also lead to coral bleaching and disease elaborates Oregon State University. Human wastewater from toilets causes problems with nutrients in the ocean. Household articles like soaps and detergents in laundering as well as food preparation are often washed directly into the ocean from coastal communities. Pet and pesticide waste from yards. In some cases, solid sludge from untreated sewage is also dumped into the oceans. For example 80% of sewage in the Mediterranean Sea is untreated according WWF (Marine Problems). Untreated sewage contains microbes or pathogens that precipitate disease which infect marine animals that can become seafood for humans. NOAA reports that much of the pollution in ocean is non-point. When soil is eroded, it carries with it many pollutants. If it is from farms then it is in the form of agricultural runoff that contains fertilizers and pesticides. This initially flows into streams and rivers, which ultimately carry these toxic chemicals into the ocean. For example, runoff from Midwestern farms into the Mississippi River is responsible for the "Dead Zone" in the Gulf of Mexico, which features very little marine life, as the EPA Effects report notes. Wastes from the aquaculture industry, especially coastal ones can be particularly damaging to marine fishes. The concentrated fish farms release uneaten food, and antibiotics polluting the seas. Moreover, there is a danger that diseases and parasites from these fish farm can affect wild fish especially migrating species, according to Monetary Bay Aquarium. 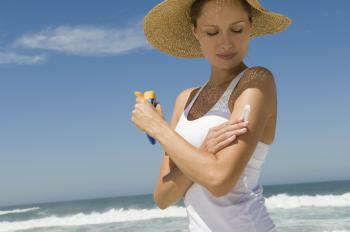 Sunscreen is a lesser known source of pollution, but can have grave effects. The chemicals in sunscreen worn by swimmers and divers washes off into the ocean water and coats plant-life on coral reefs and suffocates them. TIME reported that 4000 to 6000 tones of screen lotions entered coral areas each year by 2013. Oxybenzone and many other chemicals are the problem in sunscreens, and also affect algae, sea urchins, fish, and mammals in oceans according to a 2015 scientific study. They also found some areas have more than ten times the permissible level of oxybenzone in oceans. Even organic sunscreens that contain plant-based oils like neem, eucalyptus, and lavender which have insect repellent properties or bee-wax that is contaminated by fungicide or insecticides can be harmful to marine invertebrates. Chronic sound at low frequencies by ships and oil rigs. Acute and loud noise arising from use of seismic air guns to locate fossil fuels in the seabed by use of sound waves. The explosions are six times louder than ships. Some exploration efforts off the coast of Ireland can be picked up by simple instruments in Nova Scotia in Canada. 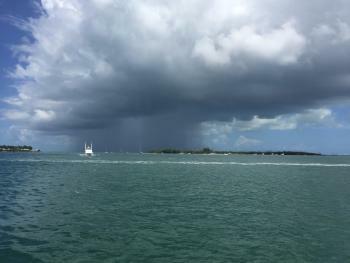 It creates a "storm of noise" in the oceans. Whales usually communicate through sound with each other for many miles when they migrate or look for mates, so they avoid regions with noise pollution, or worse stop communicating as they cannot hear their companions. This affects migration, hunting, and reproduction patterns. Dolphins are also similarly affected points out National Geographic. Small fish and crustaceans cannot survive in oceans with noise pollution. So marine animals numbers are decreasing due to noise pollution. Air pollution and ocean pollution are inextricably linked. Emissions and pollutants discharged by factories, agriculture and vehicles, have two major effects, acid rain and climate change. Pollution from automobiles and factories is translated into acid rain, which falls into the ocean and mingles with its waters, explains Integrated Ocean Observing Systems, affecting marine plant and animal lives. Though the impact is more in the coastal waters affected by other kinds of pollution, the whole ocean suffers due to acid rain according to a scientific study reported in Oceanus. Human activities in recent decades have increased the emissions of greenhouse gases including carbon dioxide that have caused climate change by increasing global temperature according to NASA. Half of the billions of tons of carbon dioxide released by human activities have been absorbed by oceans. When carbon dioxide dissolves in water, carbonic acid is produced explains National Geographic. This alters the chemistry of oceans. The PMEL Carbon Program estimates the increase in acidity is 30% and will continue to rise with continuing emissions. It observes that while the extra carbon dioxide could help some phyto-planktons, it can be disastrous for many marine animals especially ones with shells as ocean acidity is affecting availability of calcium carbonate they use to make shells. This includes oysters, clams, sea urchins, and calcareous plankton. The Alfred Wagner Institute estimates that 30% of corals will be affected as they cannot find enough building material for their bodies. This will in turn affect 400 million people who rely on coral reefs for helping with their food supply and staying safe from storms. The economic impact of ocean pollution is far-reaching. Since it affects the population of seafood, the fishing and crabbing industries, among others, are directly affected. The International Tanker Owners Pollution Federation Limited acknowledges that oil spills upset local economies of coastal towns. Tourism, fisheries, mariculture, shipyards, ports and harbors can be affected by spills and cleanup operation. In case of fisheries and tourism the disruption to businesses can be long-term. Tourism also suffers in beach communities that are overcome by other pollutants in the ocean. Back in 1988, some New Jersey beaches were shut down due to medical waste on the beach, and this impact on tourism industry is estimated to be up to 3 billion USD according to an EPA estimate. The cost of cleaning pollution is enormous too. The West Coast spends 520 million USD every year collecting trash and preventing it from ending in the oceans, according to an EPA estimate. Loss in ocean bio-diversity due to the combination of all the forms of pollution is one of the major factors affecting livelihoods of 200 million people worldwide and affects the fishing industry worth 80 billion USD annually reports Global Opportunity Network. Considering that oceans cover two-thirds of the Earth's surface, the effects from all types of ocean pollution, economic and otherwise, are felt by everyone, even humans. Since most of the pollution starts either through land, air and water pollution, preventing these forms of pollution also helps the ocean, notes Greenpeace.